I started this blog years ago when I first moved to France to be with Matt. I was waiting for my visa to come through and was looking for a way to keep myself challenged and occupied. I was new to being vegetarian and quickly realized that I didn’t know much about being in the kitchen, except that I liked it there. Over the years, the blog has had its ups and downs but it has forever remained a creative outlet for me. Sure there have been times when I stress about getting content posted or feel frustrated about my photography. It is in these moments when I have to remind myself that creativity is never a competition. And then it always feels worthwhile. Last weekend, for the first time since hitting publish, I served happy hearted food to people other than my family. I’ve dabbled in catering before, but never as a direct link to this space. So last Sunday, I put together a menu, packed up the car and set up a humble spot at the local festival. It was wild, you guys. We sold out of every last little crumb. I’d have been lost without Matt, who formed the one and only member of my hectic salad assembly line. It was messy and chaotic and totally unedited. It was awesome. That instant connection with people is what makes it all the more real. It felt like I was bringing my food to life. To all those who came out and said hi, thank you for your patience and kind words. I promise to make more dip next year. To courage, creativity and to keeping things happy hearted. 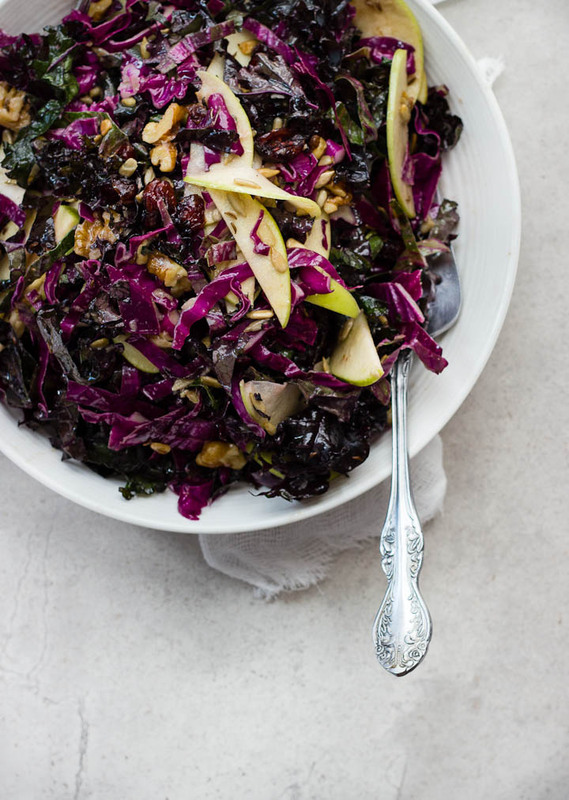 To fall flavors and red cabbage slaw. 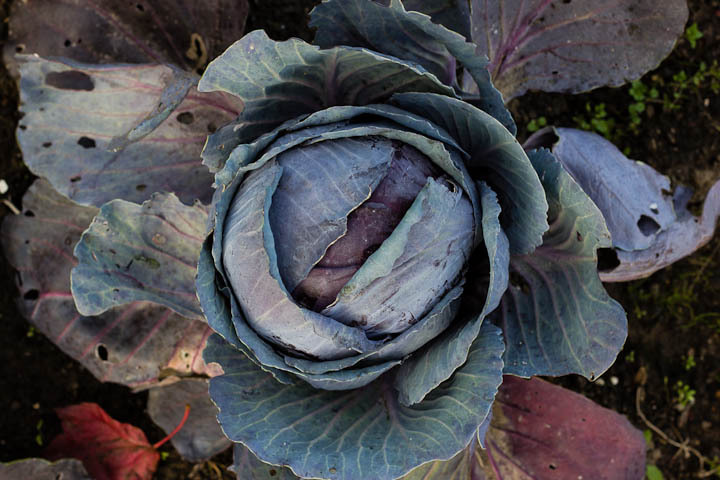 We grew some tiny red cabbage in our garden this summer. They’re all used up now after a few of these slaws but they were put to good use. 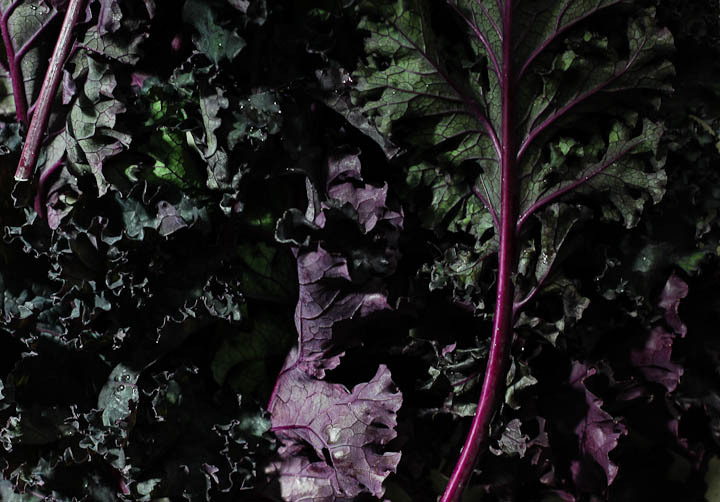 Our local farm is producing the most gorgeous purple kale and the apples are falling to the ground all over town. It’s such a good season. The nuts and seeds here add crunch and the caraway keeps things interesting. I also threw some dried cranberries on top like it was the nineties but that tart sweetness just seals the deal. Summer’s bounty turned into the flavors of fall, I just love how things are always shifting. Vegan + Gluten Free. Serves 2-4. Preheat to oven to 400 F / 200 C and and line a baking sheet with parchment. Toss walnuts, sunflower seeds and caraway seeds together with a tablespoon of olive oil and a pinch of salt. Spread out onto baking sheet and roast in the oven until brown, about 10 minutes. Meanwhile, make the dressing. 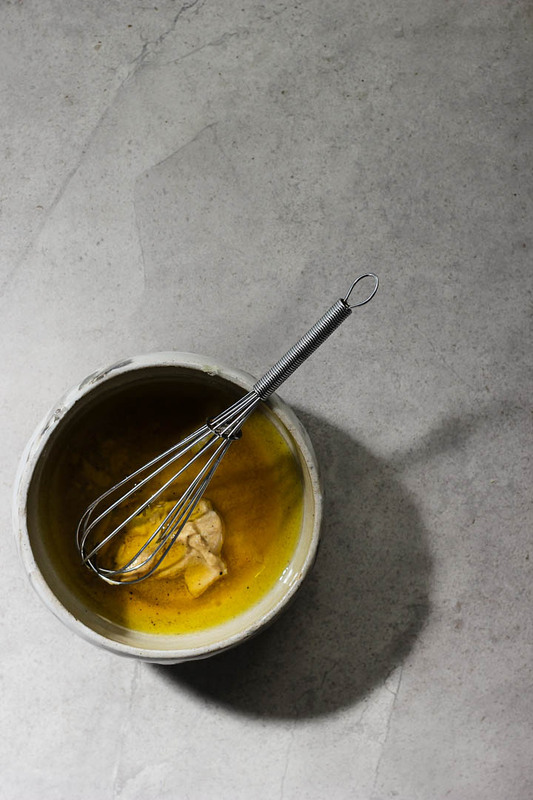 Whisk everything together until emulsified and adjust seasoning as needed. 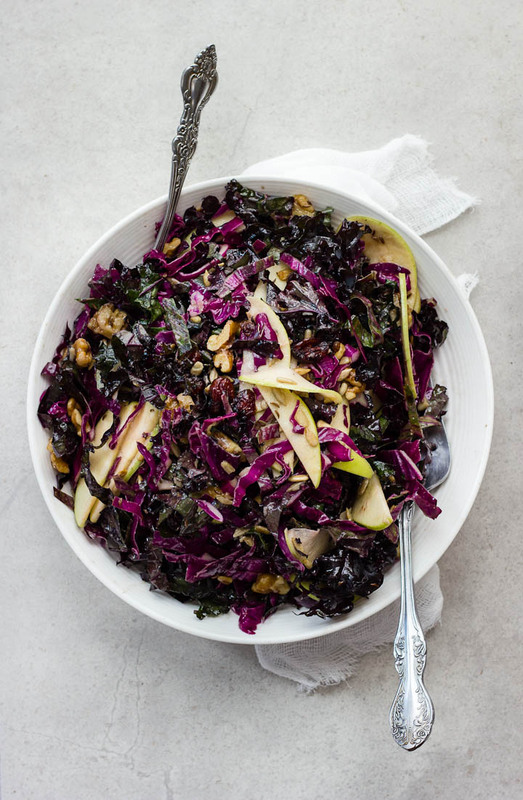 In a large salad bowl, mix together sliced kale, cabbage and apples. Sprinkle roasted nuts and seeds onto and add dried cranberries. Pour over desired amount of dressing and mix together until the cabbage and kale are well coated. 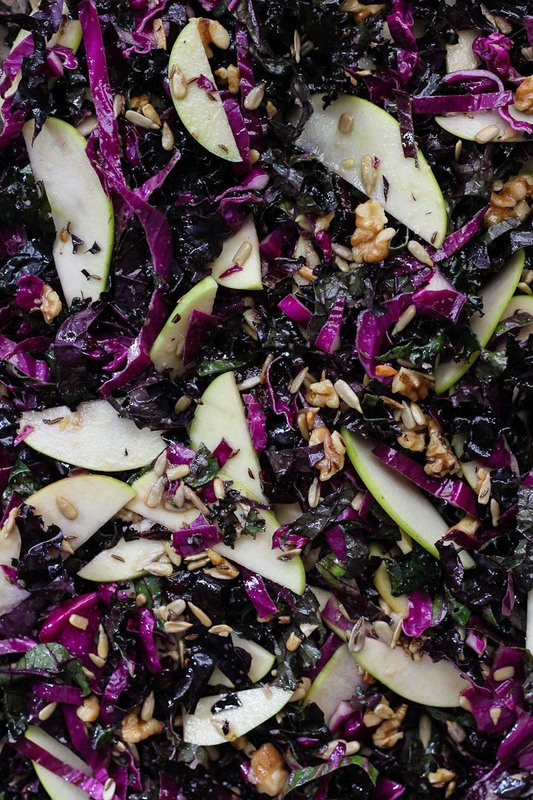 Serve immediately or let salad sit in the fridge to soak up flavors. Salad will keep in a sealed container in the fridge for up to 2 days. Mmm such a tasty sounding dressing! This salad looks awesome! 24 Blogs for Healthy Vegan Recipes - A resource for practical, everyday plant-based recipes!